From the age of fourteen, Francisco Ignacio Ruiz de la Iglesia was an apprentice in the workshop of Francisco Camilo (1615-1673) then from 1668 to 1669 was employed as assistant to the Court Painter Juan Carreño de Miranda (1614-1685). Ruiz de la Iglesia was undoubtedly one of the leading figures in Spanish painting of the late 17th century, producing oil paintings and numerous fresco decorations as well as works in tempera for illustrations of royal Entries and funerals. In addition, he was active as a printmaker. 1 Ruiz de la Iglesia’s style, which is notably distinctive, is characterised by a firm, precise line and a mastery of perspective, deployed in complex, dynamic compositions of a notably decorative nature which are also elegant and harmonious within the context of a certain classicism that is evident in a preference for architectural backgrounds and a rich chromatic range derived from Venetian painting. Ruiz de la Iglesia’s large altar paintings, such as The Defence of the Fortress of Calatrava by Saint Diego Velázquez (1688) for the convent of the Madres Calatravas in Moralzarzal (Madrid), The Assumption and The Coronation of the Virgin (c. 1690) for the church of the Corpus Christi in Seville, The Martyrdom of Saint Andrew (1696) for the parish church in Casarrubios del Monte (Toledo) and The Last Supper in the Palacio de Aranjuez in Madrid (c. 1700) are all outstanding examples of the decorative, dynamic and theatrical Baroque style that prevailed at Court in the late years of the 17th century. This was a style in which Ruiz de la Iglesia revealed the influence of Rubens and of Venetian painting fused with his knowledge of the Italian Baroque derived from works that had entered the Spanish royal collections and from his collaboration with painters who had travelled to Italy such as Francisco de Herrera (1627-1685), José Donoso (c. 1629-1690) and Sebastián Muñoz (1650-1690). Mention should also be made of the Madrid tradition exemplified by Carreño de Miranda, Ruiz de la Iglesia’s master and protector, and Claudio Coello (1642-1685), his mentor at the Palace. The mature phase of Ruiz de la Iglesia’s career coincides with the last years of the reign of Charles II and the early years of that of Philip V, during which period he obtained the position of Pintor del Rey (1689) and Pintor de Cámara (1701). Ruiz de la Iglesia’s influence remained evident on the work of a number of the artists who continued to work within the precepts of the Court style during the 18th century in the period prior to the definitive triumph of the French and Italian artists working in Madrid, whose work better corresponded to the mentality and tastes of the new Bourbon dynasty. The recent identification of a series of previously unpublished drawings by Ruiz de la Iglesia, 2 in the Biblioteca Nacional de España, the Casa de la Moneda, Madrid, and the British Museum, London, has made it possible to catalogue the present drawings, shown for the first time in this exhibition, as original works by his hand. These are fragmentary, preparatory studies in red chalk of figures and motifs intended for subsequent inclusion in complex compositions. On occasions the artist also uses black chalk for small touches and shadows. One of the characteristics of Ruiz de la Iglesia’s work is the presence on the same sheet of lightly roughed-out versions, in red or black chalk, of these same studies, which are at times also imperceptible. The artist tended to use a rough green, yellowish-brown or white paper, on occasions tinted ochre. His preference for red chalk, with which he achieved delicate, pictorial effects, is more characteristic of Italian Baroque painters such as Carlo Maratti (1625-1713) than of Spanish artists. 3 He may have derived this technique from Sebastián Muñoz, who travelled to Rome around 1680 in order to complete his studies in the studio of the renowned Maratti. The above-mentioned characteristics are identical to those in the series of recently published drawings referred to earlier. In addition to their style, the models used and the relationship with firmly attributed works by Ruiz de la Iglesia’s hand confirm the attribution of the present sheets. Study of Female Heads, Hands and Legs, in red chalk with light touches of black chalk on rough, greenish paper, includes various elements that are to be seen in Ruiz de la Iglesia’s painting of The Coronation of the Virgin. They include the female head, seen frontally and in profile, the hand that corresponds to the one behind the Virgin’s cloak, and the white clouds below the incense burner. This group is lightly repeated on the left of the drawing below the legs, a habitual practice with this artist, as noted above. Further down, the study of a left hand holding a flower (the first one above the lightly sketched group) is undoubtedly for the hand of the adolescent angel on the left of the composition, half-hidden by the clouds and looking at the Virgin’s face while offering her a white lily with his left hand, which appears behind the billows of the Virgin’s blue mantel. Finally, the legs in the drawing are the same as those that appear between the vaporous, billowing draperies of the incense bearing angel on the right of the composition. These legs are also to be seen in the angels that hold up the Virgin in Ruiz de la Iglesia’s canvas of The Assumption in the chapel of Nuestra Señora de las Nieves in the church of the Real Colegio de Santo Tomás de la Corte. 4 These angels, depicted as beautiful youths flying around the Virgin, reveal the influence of the Italian Baroque painters on the artist’s work. Male Figure in Profile supporting a Piece of Wood, in red chalk with touches of black chalk on white laid paper, tinted ochre, is a study for the executioner holding the ladder in the canvas of The Martyrdom of Saint Andrew, while another ties the saint’s arm to the piece of wood. As in the painting, the left arm holds up one of the arms of the cross, which is only lightly sketched in, but in the drawing his right hand is only very faintly suggested while in the painting it supports the other arms of the cross. Between the head and the piece of wood is an initial sketch of the left arm with the hand holding the wood, although it is barely visible. The figure, which in the final painting is depicted with its head turned and wearing a mauve tunic, is a marvellous example (particularly the head) of the artist’s interest in life studies and of his mastery of drawing, a medium which he regularly practiced from his earliest years. The reverse of this sheet, which is not tinted, has light sketches in red chalk of two figures. They are a first and second study for the figure of the executioner who, in the painting, is driving in the stake to hold up the cross, represented in the opposite direction in the painting. Beneath the most highly finished figure is the inscription: “esta a de ser”. Further down, on the left we read “Orrente (? )” and below that in another hand, “De la col. Pidal”. 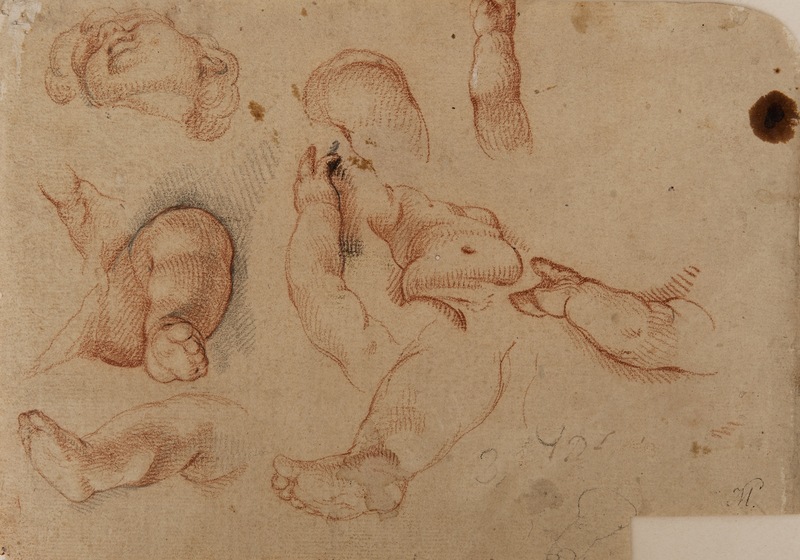 Head, Hands and Feet of an old Man, in red chalk on a sheet of lightly tinted paper attached to another sheet 5 is extremely interesting as it is inscribed in pen at the lower right “6 Rs Yglesia”, which is the artist’s second surname. The man’s vigorous head with abundant hair and white beard seems to be copied from a sculpture or cast, 6 while the studies from life of a left hand holding a staff between the thumb and index finger and the toes of a left foot suggest that this figure is a study for a God the Father, seated and covered in ample drapery that only reveals the hands and feet depicted here. This would be a figure comparable to the one painted by Zurbarán (1598-1664) for the high altar of the church of the Merced Descalza in Seville. 7 In addition, some of the studies of hands are identical to the hand of the youth holding a lance in the above-mentioned Martyrdom of Saint Andrew. Study of the Head, Torso, Hands and Legs of a Boy is executed in red and black chalk with touches of white chalk on rough laid paper tinted an ochre tone. The “M” visible at the lower right corner of this drawing is the same mark that appears on an important group of drawings in the collection of the Casa de la Moneda in Madrid, including works by Ruiz de la Iglesia. 8 This mark has been interpreted as that of Mariano González de Sepúlveda whose father, the engraver Pedro, owned a large collection of 17th-century Spanish drawings. 9 The technique, support and models for this drawing are similar to those found in two studies of boys in drawings in the Casa de la Moneda, 10 which relate to paintings by Ruiz de la Iglesia, as well as to another in the Biblioteca Nacional de España, 11 which includes the same head. The bold foreshortening of the limbs conveys the whirling movements of the child angels that accompany the Immaculate Virgins painted by the artist, in particular in the version now in the Museum of Fine Arts, Boston (1682), 12 and the one in the Museo de Navarra (1695), 13 in which the similarities are striking. Finally, in Study of two Hands, executed in red and black chalk on rough yellowish-brown paper, the position of the hand of the arm at the top of the sheet corresponds to that of a person holding something delicate between his thumb and index finger, such as a pen or brush. In contrast, the same fingers on the hand on the lower arm hold what might be the hilt of a sword with a ringed band, while the others fingers are curved over. On the reverse of the sheet Ruiz de la Iglesia has lightly sketched the first hand in red chalk, again following his habitual practice. While this drawing cannot be related to any known painting by his hand, its technique and style allow it to be considered one of the studies from life that the artist made in preparation for his painted compositions. In addition to revealing Ruiz de la Iglesia’s skill as a draughtsman and his commitment to this medium, evident since his early years as an apprentice, his approach to drawing indicates the care with which he prepared his canvases. They provided the starting point from which he achieved the harmony and exquisite taste evident in his compositions, as well as the force and expressivity of his figures, all characteristics of his work. Ruiz de la Iglesia worked in various churches in Madrid and in the Royal Palace. He executed tempera paintings of the Entry into Court of María Luisa de Orleans, 1680 (Zapata Fernández de la Hoz, Teresa, La entrada en la Corte de María Luisa de Orleans. Arte y fiesta en el Madrid de Carlos II. Madrid, Fundación de Apoyo a la Historia del Arte Hispánico, 2000) and of Mariana de Neoburgo, 1690 (Zapata Fernández de la Hoz, Teresa, “La entrada de la reina María Ana de Neoburgo (1690). Una decoración efímera de Palomino y de Ruiz de la Iglesia” in Anuario del Departamento de Historia y Teoría del Arte. IX-X, 1997-1998, pp. 257-275), wives of Charles II. A number of important engravings demonstrate his activities as a printmaker, including the plates for the book by Juan de Vera Tassis (1690) on the funerary commemorations for Queen María Luisa. Zapata Fernández de la Hoz, Teresa and Gómez Aragüete, Juan Carlos, “Nuevas aportaciones a la obra de Francisco Ignacio Ruiz de la Iglesia (1649-1703)” in Archivo Español de Arte, no. 337, 2012, pp.17-36. Carreño and Claudio Coello both used red and black chalk (Pérez Sánchez, Alfonso E., Historia del dibujo en España. De la Edad Media a Goya. Madrid, Cuadernos de Arte Cátedra, 1986, pp. 236 and 268), but preferred the latter. They also made greater use of other techniques. In addition to these works and to the top part of the altarpiece, Ruiz de la Iglesia painted the ceiling and the entrance to the chapel in fresco. When Santo Tomás burned down in 1875 the paintings entered the church of the Calatravas and subsequently the collection of the Duke of Infantado, who gave them in the 1950s to the church of the Corpus Christi in Seville where they hang on either side of the nave. This sheet also has various sentences in pencil that are not related to the drawing. According to A. Palomino (Palomino de Castro, Antonio, El Museo pictórico y escala óptica. II. Práctica de la Pintura. III. El parnaso español pintoresco y laureado. Madrid, 1715-1724 (Ed. Madrid, Aguilar, 1947, pp. 1114-1115), during his training Ruiz de la Iglesia drew academic nudes and studies of sculptures and paintings in the Royal Palace. Museo de Bellas Artes de Sevilla, S 121 G 240. Zapata Fernández de la Hoz, Teresa and Gómez Aragüete, Juan Carlos, “Nuevas aportaciones a la obra de Francisco Ignacio Ruiz de la Iglesia (1649-1703)” in Archivo Español de Arte, no. 337, 2012, figs. 3, 5, 6, 7 and 8. Durán González-Meneses, Reyes, Catálogo de los dibujos de los siglos XVI y XVII de la colección del Museo de la Casa de la Moneda. Madrid, 1980, pp. 5-6. Zapata Fernández de la Hoz, Teresa and Gómez Aragüete, Juan Carlos, “Nuevas aportaciones a la obra de Francisco Ignacio Ruiz de la Iglesia (1649-1703)” in Archivo Español de Arte, no. 337, 2012, pp. 24-25, figs. 7 and 8. Zapata Fernández de la Hoz, Teresa and Gómez Aragüete, Juan Carlos, “Nuevas aportaciones a la obra de Francisco Ignacio Ruiz de la Iglesia (1649-1703)” in Archivo Español de Arte, no. 337, 2012, p. 25, fig. 9. Various Authors, Museo de Navarra. Pamplona, Gobierno de Navarra, Departamento de Educación y Cultura, 1998, p. 169.